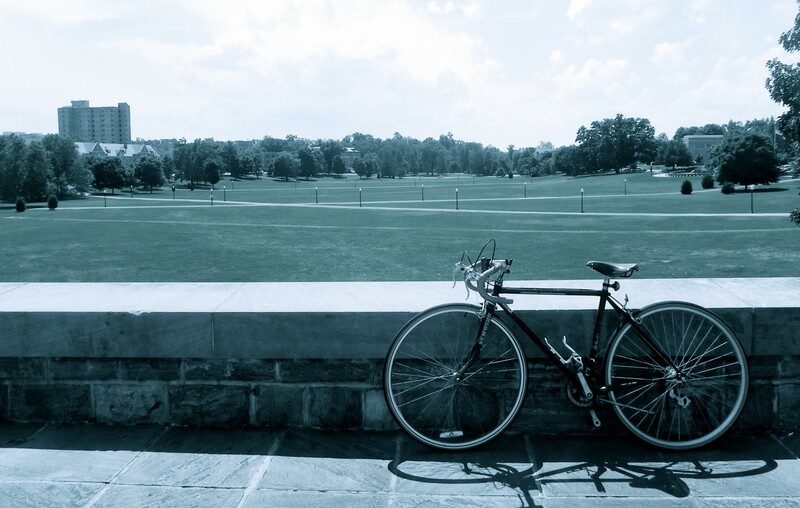 Cyclists on campus can ride on sidewalks, grass, multi-use paths, and roadways. With all of these options, it is easy to find a quick and safe route wherever you are headed. However, cyclists need to pay attention to a few details on this policy. When riding a bike on a sidewalk or multi-use path, cyclists need to follow the same rules as pedestrians. If the walkway is congested, you need to slow down to prevailing speeds or dismount and walk your bike as required. Also, crossing intersections requires cyclists to stop and look both ways, just like any other pedestrian, before leaving the curb. In case you (or someone you know) needs a refresher on sidewalk ettiquitte there are resources for multi-use trails and sidewalks, and campus cyclists should note that while most Blacksburg neighborhoods permit courteous cyclists to use sidewalks, downtown Blacksburg sidewalks are not open to bicycles. 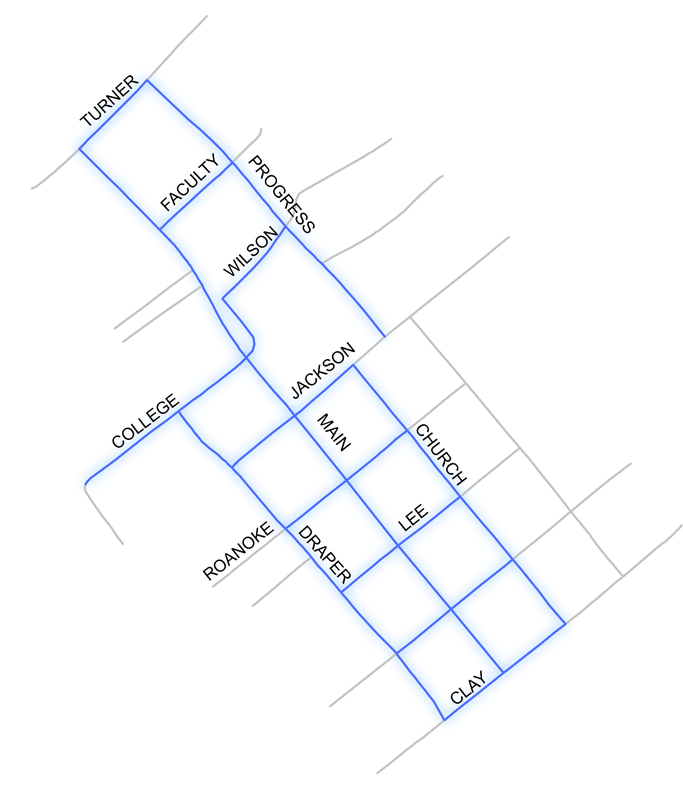 This image highlights locations in downtown Blacksburg that do not permit bicycles on sidewalks. Also, because the sidewalk network on campus is well-established and very few roads cut through the heart of campus, sidewalk cycling is convenient for many people. However, sometimes sidewalk riding can be dangerous to cyclists. 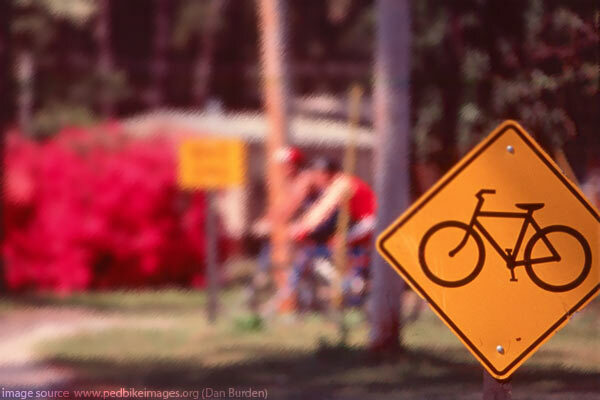 A bike in the road has to follow the same rules as a vehicle, in a nutshell: ride in the direction of traffic on the right side of the roadway. There have been several instances recently (exhibit A, B, and C) where cyclists and drivers have made it into the news because of misunderstandings between the details of the rules and the perceptions of drivers and cyclists. Luckily, there are resources that summarize these rules for the state of VA and other resources to explain when to take the lane and why cyclists take the lane. An example from VT for more proper, courteous (and legal) cycling: bikes that are headed to an “upstream” destination on the Drillfield should take the sidewalk, use one of the many paths through the center, or just take the extra few minutes to go all the way around the circle in the proper direction.